You use an ordinary bar of soap every single day, so why not turn it into something special? You can do that by decorating soap with a favorite image. 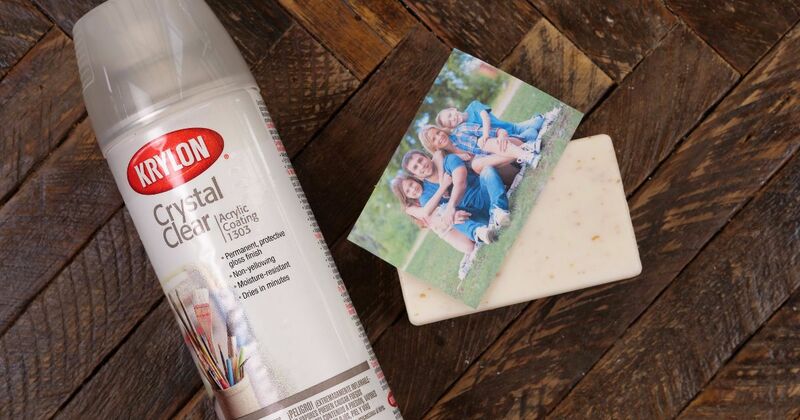 We've chosen a family photo for our soap image transfer, but you could also print out photos of pets, nature, cityscapes or any other image that makes you smile. Once you've chosen your photo, you're ready for the easy part. Simply spray the image with the right coating, submerge it in water to separate out the layers, then press the top layer onto your soap. That's all that there is to it. You can easily use this idea to create last-minute personalized gifts for everyone you know. 1. Cut your photo so that it's slightly smaller than the size of the soap bar. 2. Place the photo flat on your work surface, with the image facing up. 3. Spray the photo liberally with Crystal Clear Acrylic gloss coating spray. 4. Submerge the photo into the bowl of water, giving it time to soak. 5. Use your fingers to peel the top image from the back of the photo. 6. Discard the back of the photo. 7. Press the top image on to the bar of soap. Center it and smooth it down. Share this awesome personalized craft on Facebook.